The Temple of Mut (Temple B300) was built and carved partly into the rock base of Jebel Barkal by the pharaoh Taharqa in the 680s BCE (only parts of the inner carved chambers remain [hover over the image of Room 303, courtesy of Timothy Kendall, at the left to enlarge], and some standing columns that mark one of the outer courtyards). It lies about 25m northeast of Temple B200 (and probably formed a group of temples, with B1100, purposely built below the jebel pinnacle; see the Site History for a site plan). Mut, Hathor, and Bes are all represented in Temple B300. All of the deities can be identified in some regard with the myth of the "Eye of Re." It is possible that the colossal Bes images and the sistrum-headed Hathor images were included to soothe the anger of the goddess in the story, since Bes is a god of dance and the sistra makes rhythmic music. 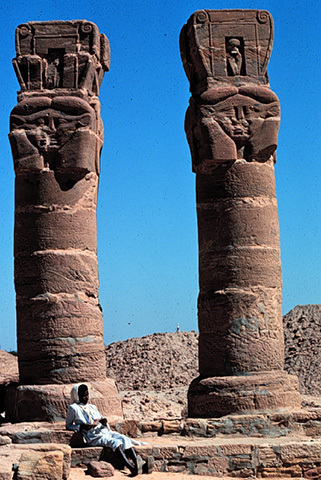 Further, the goddesses represented here have important maternal roles in the myth of the divine origin of the king (see the twin Hathor columns at the left, photo courtesy of Timothy Kendall; hover over to enlarge). According to Kendall, the pinnacle of the jebel (rising prominently above the Temple of Mut) was seen by the Kushites as phallic and a symbol of Amun's regenerative power. Thus, perhaps this temple of Mut (mother) with its apotropaic symbolism (the line of Bes statues and the systra) could have been conceived of and constructed as a symbolic womb; a female counterpart to the pinnacle. Temple B300 could represent a birthing house or a place for the mythological passage of birth, playing a role in both royal birth rituals and coronation ceremonies (also a kind of rebirth). The king then may have come to the temple to perform ritual acts of rebirth. It also seems that the temple's now-destroyed outer courtyards were built partly over an earlier building (which has been named B300-sub) that was excavated by Reisner and reported in his diary of 1919 and preliminarily dated to Thutmose III or IV. Recent investigation of the blocks of B300-sub indicate that it was most likely built by Ramses II. The 3D digital model of the Temple of Mut (B300) by LEARNING SITES is based on the excavated evidence uncovered by the Museum of Fine Arts, Boston, the plans and drawings of several 19th-century travelers to the site (Linant de Bellefonds, Cailliaud, and Lepsius), and new interpretations by Timothy Kendall. The two renders at the left are from our latest model (hover over to enlarge; B300 is the temple with the columned porch; next to it is Temple B200). 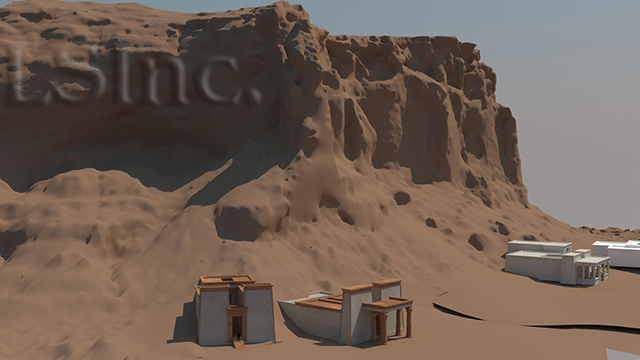 LEARNING SITES began a final version of Temple B300 in 2015 based on a re-evaluation of the evidence and new photomodeling of the site, jebel, and temple contexts, under the direction of Timothy Kendall (as part of the Qatar-Sudan Archaeological Project). This new model will be part of a comprehensive virtual world research resource and digital publication of the entire site, most likely using the Unity game engine, which will debut here during 2016. Learning Sites (very preliminary) virtual world of Temple B300 created with the Unity game engine. Navigate with the arrow keys or the 'W,' 'A,' 'S,' and 'D' keys; press 'C' to freeze the cursor while you look around or explore the rest of this page. Also, you can toggle on and off the minimap using the 'M' key; toggle on an off the time period slider using the 'T' key; and turn on and off a sun slider with the 'Y' key. Enjoy ! 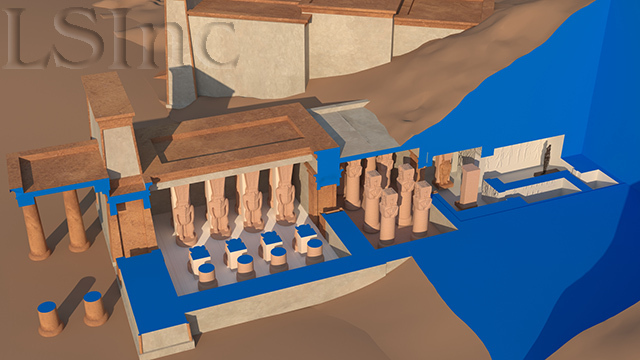 An earlier 3D model of the temple was created in 1998 (see views of the facade porch and of the reliefs in room 305 from that model at the left; hover to enlarge). Back then, the model was exported as a virtual reality world using VRML to be used as an educational resource. Renderings of that model were also published in numerous magazines and journals around the world, distributed to schools on CD, and used in several conference presentations by Kendall and LEARNING SITES staff. 1826 Voyage à Meroé, au fleuve blanc.... 4 vols. Paris. 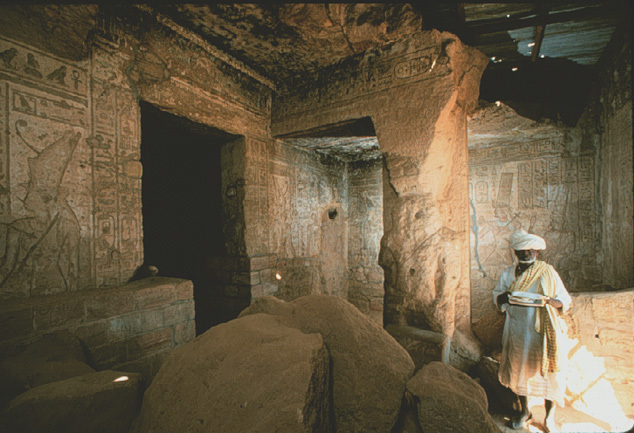 1990 "The Gebel Barkal Temples, 1989-90: a progress report on the work of the Museum of Fine Arts, Boston, Sudan Mission," Seventh International Conference for Nubian Studies, Geneva, September 3-8, 1990 (privately printed and distributed). 1849-59 Denkmäler aus Aegypten und Aethiopien.... Berlin. 1958 Journal d'un voyage à Meroé dans les années 1821 et 1822. edited by M. Shinnie. Sudan Antiquities Service Occasional Papers #4. Khartoum. 1989 Das Bildprogramm des Mut-Tempels am Gebel Barkal (Veröffentlichen der Institut für Afrikanistik und Ägyptologie der Universität Wien, #52). Vienna. 1975 Apedemak, Lion God of Meroe: a study in Egyptian-Meroitic syncretism. Warminster.